If you have a physical disability, finding the right used vehicle is crucial — but it can also be challenging. You want to find the best value without having to make sacrifices when it comes to accessibility and safety. The seemingly endless options are beneficial in many ways, but can make it tough to know where to even begin. This guide will help you establish what accessibility modifications you may need in a used vehicle and go over the general model options you can choose from within your parameters. It will also offer some brief insight into your financial aid options so that your mobility doesn’t have to break the bank. Keep in mind that sometimes the best option is purchasing a used car and modifying it as needed, so don’t be afraid to take your time when it comes to finding the best vehicle for you and your family. The first question to ask is who will be driving: you or a caregiver. If you’ll primarily be a passenger, it’s important that any modifications are not only accessible to you, but easily used by your caregiver, as well. If you’re a senior, for example, and your spouse usually takes care of transporting you, you may wish to opt for a wheelchair lift instead of a slightly more challenging ramp. If you’ll be driving and you haven’t done so already, you’ll need to set up an evaluationwith an occupational therapist or certified driver rehabilitation specialist to determine what your modification needs are. The assessment will cover your strength, flexibility, coordination and reaction time, range of motion, perception, and motor skills. You’ll also need to consider your situation specifically: do you have a condition that could worsen over time? Do you suffer from pain that could inhibit your abilities? Be as straightforward with your specialist as possible, and don’t be afraid to ask questions if you’re feeling unsure. It’s important to address any potential issues ahead of buying, because fixing them later could be more costly. Once you know what your specific needs and limitations are, it’s time to start looking at which modifications will be right for you. First, consider your loading needs. If you have a wheelchair, is it able to be folded and stowed easily or do you have a power chair that will need more space? If you’ll be driving, would it be more convenient to drive from your chair or would you prefer to have a transfer seat installed? An important component of loading will be to consider how much parking space you have at home: for instance, if you have a smaller driveway and no garage, a chair lift might not be a practical option. Think ahead to the places you regularly visit, as well, like your workplace, your child’s school, and the grocery store. In general, what will be the most logical loading option without over-taxing your body? Your mobility specialist will have valuable insight on what’s worked for other clients, but make sure you go with an option that makes you and your caregiver comfortable. Your region’s climate is another important loading factor. If you live somewhere with traditionally scorching summers and especially biting winters, you’ll want an option that gets you into your vehicle as quickly and simply as possible. Your caregiver may not have any issue working a ramp in the springtime, but will he or she have any trouble in potentially icy situations? It could even be as simple as making sure you have a cover for your wheelchair when it’s mounted to the vehicle’s rear. Think of the worst weather you’ve seen in your area and ask yourself: would we be prepared to handle it? If you have limited mobility of your legs and feet, hand controls can replace the traditional pedal system for your car. Depending on your upper body strength and range of motion, you have several options: some are operated by pushing, pulling, twisting, or rocking. Your mobility specialist may have models that can give you an idea of what it would be like, and again it’s crucial to consider your personal situation. If you are living with a condition that tends to worsen and may weaken your muscles over time, think ahead. Though you may have plenty of strength for a pull system today, several years from now you may not. Remember, your vehicle is an investment, so you want to make sure you get the most out of it for as long as possible. There are also steering aids that can help those with limited range of motion. Some modifications will bring the wheel itself within closer reach, others will replace the wheel entirely to make for easier maneuvering. Low-effort steering systems cut down on the strength needed to operate by about 40%, while zero-effort systems drop it by about 70%. If you have one arm that’s significantly stronger and more mobile than the other, there are even one-hand control systems. Once you’ve established all the modifications you’ll need, you can start looking at vehicles themselves. Traditionally, full-size vans have been the preferred mode of accessible self-transportation since they tend to be the most spacious. In recent years, however, many have opted for more modern choices like trucks, sport utility vehicles (SUVs), and even coupes or sedans. Perhaps the biggest advantage of going the more modern route is that full-size vans, especially those already equipped with accessibility modifications, can be quite expensive. For those who don’t require a wheelchair and have sufficient upper-body strength, it can also be especially beneficial to have a lower access point to get into the car. If your home parking situation is limited, a coupe can give you more room for transferring, plus its lower center of gravity makes it less prone to a rollover. But it’s important to take your area’s climate into account, as well. If you live somewhere that sees a lot of rain or snow, you’ll want a car with all-wheel drive, which is more commonly found in trucks, vans, and SUVs. Some people also appreciate the increased visibility granted while sitting up higher, especially in inclement weather conditions. In many instances, you can find a happy medium by opting for a minivan or a small SUV that comes with all-wheel drive — you’ll have more space for loading as well as inside, better driving control in all conditions, and it still won’t take up too much room if you have limited parking space. You’ll want a car that makes the driving experience as simplified as possible, especially if you’ll be the one in the driver’s seat. Power windows, power locks, and an automatic transmission are essential. Your adaptive equipment may extend to your gear shift, but if not, make sure it can be used without a button. Even if your strength is good now, over time (and regular driving) it could become increasingly difficult. Automatic seats are another excellent option to make loading easier, though some may prefer the extra space that bench seating offers a driver. You should also take dashboard controls into consideration: if you have poor mobility in your wrists, twisting knobs can present a real challenge. Make sure you look for a vehicle — or modifications — with controls that are easy to read and operate based on your needs. You may even want to consider a vehicle with touch screen controls or voice activation. Ultimately, you’ll probably have better luck purchasing a vehicle that meets your general criteria (desired model, automatic transmission, power windows, etc.) and having modifications added yourself. The cost of modifications will range, but in most instances having the modifications made yourself can give you additional support: the dealer that installs them should have a specialist who can train you on the equipment and answer all your questions, and will likely be the best option for repairs in the future. Unfortunately, it can be costly to purchase and modify a vehicle to meet your accessibility needs. The good news is that there are options for financial aid. These are just a few available nation-wide, but you can also check with local organizations and groups in your area that may offer grants or further financial support. Bank of America offers disability access loans to buy, refinance, or modify a vehicle with accessible adaptive equipment. The Special Kids Fund helps children, adults, and veterans with disabilities find wheelchair accessible vans through their program. R&J Mobility Service has a list of national organizations that can aid in accessible vehicle funding. Effective Oct. 1, 2016, American veterans or service members with a disability related to their service may be eligible for a grant toward the purchase of an accessible vehicle or modifications to an existing vehicle. Elderly financial exploitation is becoming a significant and growing problem in New Hampshire as well as in the rest of the country. To get an idea of the severity of the problem, according to the National Adult Protective Services Association (NAPSA), a national nonprofit with members in all 50 states, 1 in 20 older adults indicate some form of perceived financial mistreatment occurring in the recent past. Also, according to a 2011 MetLife study of elder financial abuse, as much as $2.9 billion per year is stolen from seniors. In-home care providers charging for services; keeping change from errands, paying bills that don't belong to the vulnerable adult, asking the vulnerable adult to sign falsified time sheets, spending their work time on the phone and not doing what they are paid to do. New Hampshire already has a mandatory reporting law directing any person suspecting exploitation of an incapacitated adult (or a person believed to be incapacitated), to report such suspicion to the commissioner of health and human services. However, HHS jurisdiction only extends to "incapacitated" adults, which excludes many other vulnerable, older adults susceptible to this type of abuse. Because of this gap in the law, New Hampshire lawmakers passed legislation amending the criminal code to make financial exploitation of an elderly, disabled or impaired adult, a criminal offense. They did so with the help from the Senior Law Project of New Hampshire Legal Assistance and the Merrimack County Coordinated Community Response Team, a multi-disciplinary team consisting of 22 different organizations and community members working to improve response to elder abuse through increased collaboration and coordination. Prior to this statutory change, unless the incident involved an obvious crime, such as a forged check, it was common for reports of financial exploitation to be considered "family" or "civil" matters, leaving those who report their suspicions, or leaving the victim, with nowhere to turn and the perpetrator free to continue the exploitation. As of Jan. 1, 2015 RSA 631:9 and :10, the sections of the criminal code dealing with assault and related offenses, gives law enforcement officers and prosecutors clear guidance on what constitutes the crime of financial exploitation, thus supporting efforts to successfully investigate and prosecute offenders. 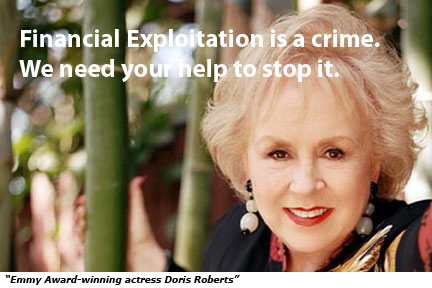 Under the amended law, for example, it is criminal financial exploitation if a person, in the absence of legal authority, knowingly or recklessly uses undue influence, harassment, duress, force, compulsion or coercion to acquire property (real, personal, or financial), of an elderly adult, or to establish a fiduciary relationship that gives the person control of the elder adult's property. "Undue influence" is defined in the new law to mean the intentional use, by a person in a position of trust and confidence, of that position to obtain an unfair advantage over the elderly adult, through actions or tactics, including emotional, psychological and legal manipulation. It is also criminal exploitation under the amended law if in breach a fiduciary obligation recognized in law, property of the elderly adult is used for the benefit of someone other than the elderly adult. Because of this amendment to the criminal statutes in New Hampshire, there are more clearly delineated avenues to intervene and address, and hopefully reduce, financial abuse of the elderly. The first step is to increase awareness among all stakeholders so that this crime is recognized, reported and prosecuted. Dear Veterans, Visiting Angels Appreciates Your Service! served as military veterans in the United States Armed Forces. who died while in military service. Guard and Reserve in support of hiring Veterans. Check us out on their Facebook Page. If your parent is beginning to display some memory problems, and over time most of us will, it's important to determine if this is only mild cognitive aging or the beginning of Alzheimer's or another form of dementia. Why is this important? Because a person with mild cognitive impairment can continue to function somewhat normally. She may not be able to remember names or words as readily, but this is not a progressive ailment that indicates radical lifestyle changes are needed, it's just part of the aging process. Do you know how to tell the difference? Over a three-to-five year period, if your parent is struggling with only mild cognitive impairment, there is about a 50% chance she will remain at about the same level or perhaps improve slightly with diet and other lifestyle changes. That means there is also about a 50% chance she will continue to decline as Alzheimer's or another form of dementia progresses. For a very small percentage of people (5-10%) whose dementia has been caused by such things as vitamin B12 deficiency, overmedication, depression or a thyroid disorder, dementia may be reversible. So other than waiting to see if the mild cognitive impairment blooms into full-blown dementia, how do you tell the difference? See a neurologist or gerontologist. There are weighted psychological tests that, when administered along with brain scans (amyloid PET scan), can indicate the presence of Alzheimer's disease even in its early stages. With Alzheimer's, nerve cells in the brain die. With normal cognitive aging, they just don't work as well. Although some researchers say there is no definitive way to diagnose Alzheimer's except with a post-mortem autopsy, if the brain scan is negative then Alzheimer's can be crossed off the list. Once you receive a diagnosis, then you can determine your course of action, whether that involves care planning, financial planning or legal matters. Older adults can feel better now and stay healthy for the future by choosing wholesome, nutritious foods. 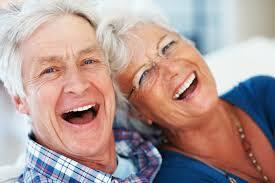 A balanced diet and physical activity contribute to a higher quality of life and enhanced independence as you age. Fruit – Focus on whole fruits rather than juices for more fiber and vitamins and aim for at least 2 to 3 servings each day. Break the apple and banana rut and go for color-rich pickings like berries or melons. Veggies – Color is your credo in this category. Choose antioxidant-rich dark, leafy greens, such as kale, spinach, and broccoli as well as orange and yellow vegetables, such as carrots, squash, and yams. Try for 2 to 3 cups or more of veggies every day. Calcium – Maintaining bone health as you age depends on adequate calcium intake to prevent osteoporosis and bone fractures. Older adults need 1,200 mg of calcium a day through servings of milk, yogurt, or cheese. Non-dairy sources include tofu, broccoli, almonds, and kale. Grains – Be smart with your carbs and choose whole grains over processed white flour for more nutrients and more fiber. If you’re not sure, look for pasta, breads, and cereals that list “whole” in the ingredient list. Older adults need 6-7 ounces of grains each day (one ounce is about 1 slice of whole grain bread). Protein – Adults over 50 without kidney disease or diabetes need about 1 to 1.5 grams per kilogram (2.2lbs) of bodyweight. This translates to 68 to 102g of high-quality protein per day for a person weighing 150 lbs. (0.5 g of protein per lb. of body weight is close enough). Try to divide your protein intake equally among meals. It’s important to vary your sources of protein instead of relying on just red meat, including more fish, beans, peas, eggs, nuts, seeds, milk and cheese in your diet. Water – As we age, some of us are prone to dehydration because our bodies lose some of the ability to regulate fluid levels and our sense of thirst is may not be as sharp. Post a note in your kitchen reminding you to sip water every hour and with meals to avoid urinary tract infections, constipation, and even confusion. Vitamin B – After the age of 50, your stomach produces less gastric acid making it difficult to absorb vitamin B-12—needed to help keep blood and nerves vital. Get the recommended daily intake (2.4 mcg) of B12 from fortified foods or a vitamin supplement. Vitamin D – We get most of our vitamin D intake—essential to absorbing calcium and boosting muscles—through sun exposure and certain foods (fatty fish, egg yolk, and fortified milk). With age, our skin is less efficient at synthesizing vitamin D, so consult your doctor about supplementing your diet with fortified foods or a multivitamin, especially if you’re obese or have limited sun exposure.